Ships flat from our factory, for easy transport and storage. Contact Us for sizes or quantities. Alumalite is a strong, aluminum composite panel with a high density, corrugated polyallomer (CPA) core that will not swell, wick water, corrode, rot, or delaminate due to prolonged water exposure. The surface is .016-inch high-gloss painted aluminum. An aluminum surface is required on both sides for rigidity and to minimize warping. Alumalite features a factory baked acrylic-painted aluminum faces for high gloss brilliance and is warranted not to crack, chip, flake or peel. D-Lite has a finished aluminum surface that won’t crack, chip, flake or peel and has a waterinsensitive, plastic core, making it perfect for your outdoor or UV- exposed indoor applications. The core is a high density, corrugated polyallomer (CPA), that will not swell, wick water, corrode, rot or delaminate. The finished surface is .012-inch, high-gloss white aluminum on two sides, or with a light gauge aluminum backer. An aluminum surface is bonded to both sides to balance the board and maximize flatness. The core is a high density, corrugated polyallomer (CPA), that will not swell, wick water, corrode, rot, or delaminate due to prolonged water exposure, making it perfect for all outdoor applications. The finished surface is .016-inch high-gloss white aluminum, with a light gauge unpainted aluminum backer. Econolite features a highly reflective, factory baked, acrylic paint surface that is warranted not to crack, chip, flake or peel. 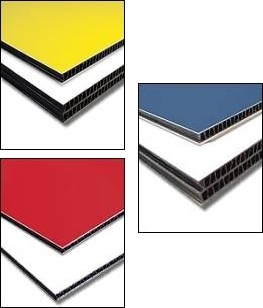 Econolite is best used in applications when all four sides of the panel are supported, such as wall mount signs, fascia, canopy, or supported post and panel signs. You will be able to purchase this item on line very soon.